Thanks to New Horizons, scientists now know Pluto is a bit bigger than thought, with a diameter of 1,473 miles (2,370 kilometers), but still just two-thirds the size of Earth's moon. And it is most certainly not frozen in time. 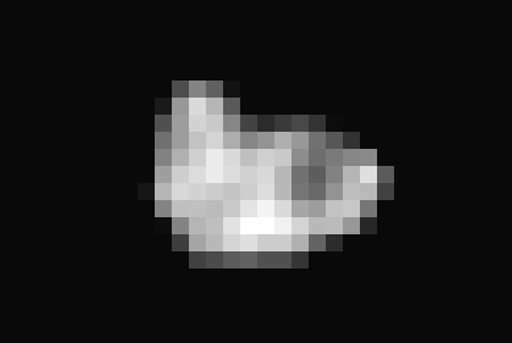 The zoom-in of Pluto, showing an approximately 150-mile (241- kilometer) swath of the dwarf planet, reveals a mountain range about 11,000 feet (3,353 meters) high and tens of miles wide. Scientists said the peaks—seemingly pushed up from Pluto's subterranean bed of ice—appeared to be a mere 100 million years old. Pluto itself is 4.5 billion years old. 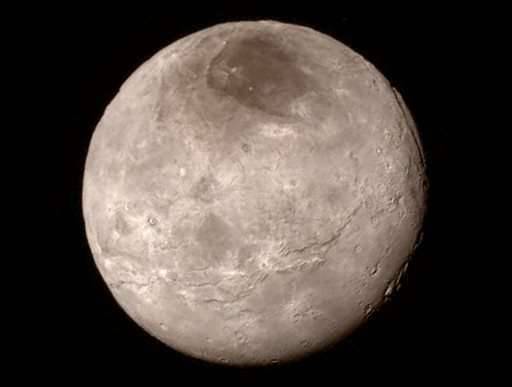 As for Charon, which is about half the size of Pluto, its canyons look to be 3 miles to 6 miles deep and are part of a cluster of troughs and cliffs stretching 600 miles (965 kilometers), or about twice the length of the Grand Canyon, scientists said. The Charon photo was taken Monday. 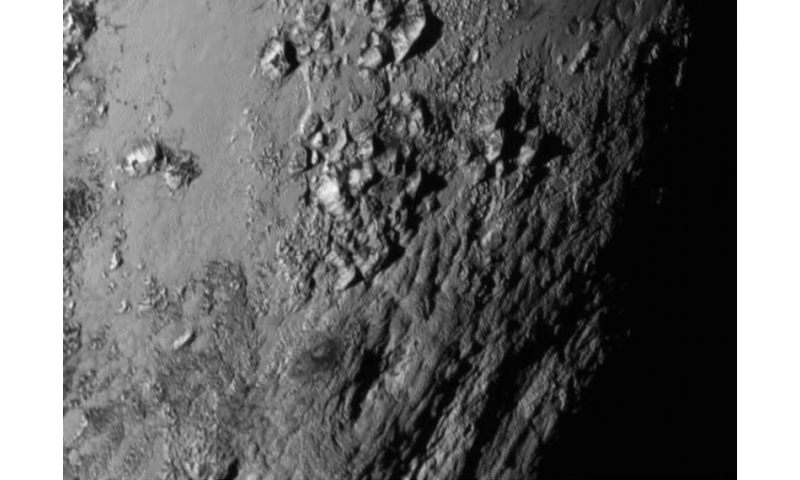 The Pluto picture was shot just 1½ hours before the spacecraft's moment of closest approach. New Horizons swept to within 7,700 miles (12,391 kilometers) of Pluto during its flyby. It is now 1 million miles (1.61 million kilometers) beyond it. Scientists promised even better pictures for the next news briefing on Friday. Johns Hopkins University's Applied Physics Laboratory is in charge of the $720 million mission. Indeed, the appearance of Pluto and his moon is a surprise. First we are underestimate significant influence of gravity in the dual system (increasing geological processes). The second is the (possible) a overlooked that the events in inclined orbit and distance from the sun are significantly reduced. I dunno, why the NASA astronomers are so obsessed to demonstrate, that the Pluto is dynamic world with fresh mountains and plumes. Obsessed? What do you even mean by that? They are reporting facts and speculations based on first impressions. No one at NASA cares one wet fart whether Pluto has the label planet or not. That doesn't matter anything to anyobody. What is shame is not to have more images of the other side, which had the most intriguing features. I propose this: Fly-by probes like this may have a slave nanoprobe to observe the other side. In just few kilograms (1% to 2% of the weight of main probe) you can pack a decent lens, a small battery for few hours, a gyroscope and a smartphone style computer and antenna to send the images to the main probe. No engine and no fuel. No - you just fit the 'data' to whatever you want to believe in the first place. You are religious. You have a god and everything must fit to that the will of that god - and that god (in your mind) is you. And (naturally) you assume that other people are like you. But they are not. You are an exception (and not in agood way. More in the pathopsychological way). And until/unless you realize that you are not normal you will never understand the scientific mind or how science works. You should employ some other, different way - well, and the most different way is simply the opposite, dual way. Most different is not best. Just because it is useful to start of in the direction of your goal when searching for the best path doesn't mean that it's sensible to start walking in the OPPOSITE direction of where you're looking in search for a better pathing algorithm. It's just dumb. and c) (and this is most important) is at least as good at as the old strategy in all circumstances. That's the reason why to date not a single other poster has been impressed by what you write. It would be nice if the comments section for each article could be split into two tabs, one for scientific discussions and the other for pseudo-science and religion. Unfortunately that would require a lot of moderation--it's difficult enough to get spam deleted here. I don't know how do you manage to make such deduction. Neither 'geologically active' nor the oposite do satisfy definition. None of the major planets meet the third condition either, so it makes no sense that any of them are called "planets". collectively as "Small Solar System Bodies". Condition (c) is rather ambiguous... unless this is taken into account only for celestial bodies that have already satisfied conditions (a) and (b). 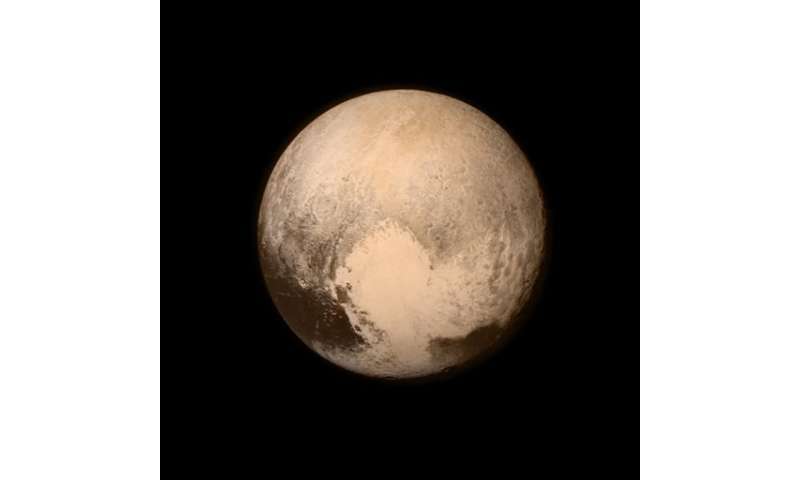 No one at NASA cares one wet fart whether Pluto has the label planet or not. That doesn't matter anything to anyobody. >> In a live interview on Nasa TV on Tuesday, Charles Bolden, Nasa's chief administrator, said he hoped the scientists would reconsider the name. "I call it a planet, but I'm not the rule maker," he said. NASA, and most astro and physics scientists have an *opinion* on Pluto's status, but I doubt any one of them actually care enough about their opinion to create policy over it. That's what "no one cares/ doesn't matter to anybody" means. If Charles Bolden did Not care enough about his *opinion* then he would Not be expressing his *opinion* to the media. The way things work is that he cares enough to say something and maybe hopes to influence those that can and do create policy. What this really means is you and AA are wrong but are too proud to admit your mistake. Did any of you see the guy in the back of the room in the dark suit? He is a federal officer still looking for Jimmy Hoffa. If one considered the EDM angle, the material excavated to create Charon's canyons could very well have resulted in the mountains on Pluto. Does anyone know why the scientists have determined the mountains are made of ice? I can't find any info on it. Pluto looks like an avocado seed. John Spencer gives an answer to that starting at the 20th minute of the linked video. https://www.youtu...daOhG9wE Of course it is still very speculative but Pluto's density does not gives much latitude for anithing else. Does anyone know why the pseudoscience cranks believe comets are made of rock? I can't find any evidence of it. Unless somebody would like to provide some. Given that that isn't going to happen, how do crank science believers get through the day? Thornhil (who?) tells them they are right, or they have an undying belief in Velikovsky. Evidence of this nonsense would be good, not to mention novel. Not holding my breath. One can definetly not speculate but confirm that pluto was hit by many meteorites. At least small ones. The heat of the impact and burning of the meteorite melted the surrounding ice and covered the site of the impact. so you say... well then, as you have a system, you can show or give a methodical demonstration... or perhaps just elucidate the method you use, as well as how you account for noise and determine what is considered paradigm and what is considered non-paridigm? as this is a Psych system, it must contain criteria for inclusion or dismissal, as well as noise. this is sufficient for initial psych classifications but after that, there is a specific methodology required for distribution of data as well as classification which allows for blind judgement for classification while segregation is acquired to insure non-biased fidelity. ...stupidity is my systematical paradigm. Strangely, anti, you do exactly the same. You too are religious in the way you accept without question and full of faith the idea that the solar system is 4.5 billion years old. As a result, you cannot explain why it is that a very isolated solar body that is smaller than our moon still has enough heat left after the supposed 4.5Ga to still be geologically active. The only explanation you or any materialistic/naturalistic scientist will be able to come up with will seem like magic - full of speculation with no substantiating facts - because you ignore the simplest, most direct and most straight-forward explanation: Pluto is in existence for far fewer than 100k years. Your religion cannot accept that explanation so you have to denigrate and insult anyone who dares to think differently than you. It's hard to post the worst comment of the day at PO, there is lots of competition but you're the winner by a mile. Who are you even arguing with? Apparently you have some beef with the Thunderbolts team, since your babble has nothing to do with anything I ever type. I've seen numerous mentions of "ice mountains" and would just like to know how they made that observation/presumption. There is no need for your adolescent insults. of course it's still speculative but Pluto's density does not give much latitude for anithing else. Thank you very much for the response TechnoCreed. tThe only explanation you or any materialistic/naturalistic scientist will be able to come up with will seem like magic - full of speculation with no substantiating facts - because you ignore the simple and most straight-forward explanation: Pluto is in existence for far fewer than 100k years. I would like to hear more about this straight forward explanation.What scientific evidence do you have for it? No speculation or supernatural/magic entities please. And these are just some I can come up with off the cuff without being particularly versed in astronomy. Pluto is in existence for far fewer than 100k years. And this outrageous statement is based exactly on what? I mean if you accuse us all of 'religious belief' I'm sure you have some hard evidence to back this up. Pluto has very little evidence of impact craters, much less evidence of large impactors. Pluto's atmosphere at surface is a whopping 3 microbars making it roughly .000003 percent of Earth's. "impacts at Pluto's distance from the Sun happen between cold bodies with low density that aren't moving very fast (at least, not compared to the Earth-Moon impact)." So at present, there's no energy being generated in Pluto or Charon through tides. But in the past, there COULD'VE been quite a lot of waste heat from tidal dissipation. So you have to SPECULATE gravitational capture, however electrical capture happens rather quickly. SO where are the craters? 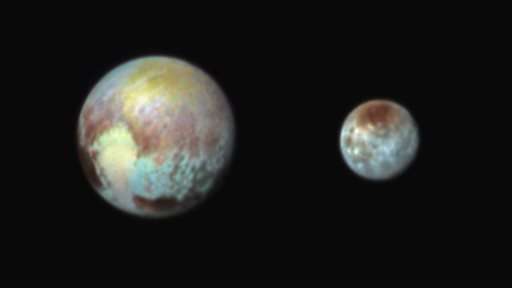 Why are there mountains on Pluto and huge canyons on Charon much larger than earth? You have no clue. To be fair, the difference in temperature between methane ice and methane gas, or nitrogen ice, liquid nitrogen, and nitrogen gas is more than an order of magnitude smaller than the difference in temperature between magma and solid rock of the same composition...so temperature variations needed to drive the geology or weather on Pluto and Charon are actually not as large as the required temperature variations to do similar things on Earth. Also, because surface gravity is so much lower, it takes much less energy to uplift the same mass, such as those mountains, than it would take to do it on Earth. My opinions are not rooted in apealing to your positive affirmation. I care about facts, not "Likes". Poor, poor fools even bothering to "1" me, as if I actually care. I actually find it funny how many people are dumb enough to actually bother to stop and down-vote me. if you care about facts, why is it that your posts are filled with unsubstantiated conjecture, personal opinion, anecdotal and unvalidated claims, delusional beliefs (like that abduction you ranted about recently) or the pseudoscience of the above? "I actually find it funny how many people are dumb enough to actually bother to stop and down-vote me." You actually cared so much you needed to point it out. This is like adolescent psychology. "The lady doth protest too much, methinks"
I was not "abducted" by the Alien, nor was I ranting. The alien did not harm me in any way. Moreover, to be sure, I learned more from the Alien than it learned from me. They are in fact telepathic, but their eyes, though larger than human eyes, aren't as large relative to head size as the stereotypical "grey" drawn on conspiracy programs, like ancient aliens. Really amazing pictures, too bad we have to wait 16 months to get it all! Pluto doesn't get enough sunlight to absorb any significant amount of energy to drive volcanic/geologic activity. Furthermore, it isn't in any orbit around a significant planet to induce tidal heating. Lastly, it's density is so low as to indicate that heating cannot be derived from a radioactive core (much higher density required). What this means is that if Pluto is supposedly 4.6 billion years old, it would have lost all of its heat to space by this time since it is so small. In fact this is exactly the reason why scientists were so completely blown away by the geologic activity. That leaves the best explanation for such activity to be the fact that Pluto is in fact much, much younger than 4.6 billion years. My estimate is less than 100k years for this small body to exhibit such available heat. The only other explanations that are available at the moment - given the 4.6 billion years assumption - are based on sheer speculative miracles.